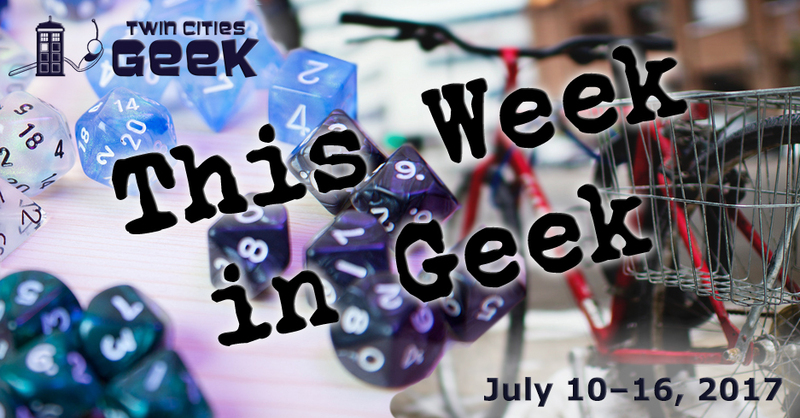 Welcome to This Week in Geek, your guide to events of interest to the Minnesota geek community for the week of Monday, July 10th through Sunday, July 16th. When: Tuesday, July 11th at 5:00 p.m.
GlitchHQ will be hosting Gaymer Space, a monthly event giving the LGBTQ+ community a place to gather, game, and geek out over shared interests like video games, board games, and the industry. This free event lasts from 5:00 to 8:00 p.m. and will provide a casual space to hang out that should be fun for all ages. When: Tueday, July 11th at 6:30 p.m.
Kotatsu is a monthly opportunity to hang out with fellow Anime Twin Cities members and fans in a casual environment. Bring card games, writing, knitting, or just yourself, and enjoy a public hangout session. Look for the table with the “ATC” logo. When: Tuesday, July 11th at 6:30 p.m. Hear some catchy tunes and learn how to dance while experiencing the tapestry of Twin Cities culture at 9 Nights of Music. This weekly event begins with dance instruction before leading to musical performances. This week’s performer is Bassface. When: Tuesday, July 11th at 7:00 p.m.
Come and experience YogaQuest, a blend of yoga and fanfiction storytelling led by certified yoga instructors. Experience a yoga workout experience and a story at the same time. This week’s theme is Game of Thrones, so get yourself in prime White Walker fighting condition. Books and Bars is an “open public book club show” hosted and moderated by Minnesota Public Radio senior producer Jeff Kamin that provides attendees with “a unique atmosphere for a lively discussion of interesting authors, fun people, good food, and social lubrication.” The book being read and discussed this month is Dark Matter, a novel by Blake Crouch. When: Wednesday, July 12th at 5:00 p.m. Hang out with a bunch of cool dogs and their humans at Summit Brewing and Pet Haven’s Pints for Paws event. Enjoy dog photo booths, a silent auction, Frisbee, agility courses, food trucks, and beer (2 drink tickets are included with the $20 admission fee). The MN Publishing Tweet Up will be gathering at Boneshaker Books for networking, beer-sharing, and sharing a love of books and publishing. This is a great opportunity to meet fellow publishing geeks in a great community bookstore. When: Wednesday, July 12th at 6:00 p.m. Dress in stretchy and comfortable clothes for an intense night of capture the flag, followed by a postgame wrap up at a nearby brewery. The game will likely involve a lot of tagging, jogging, and fun. When: Wednesday, July 12th at 7:00 p.m. When: Thursday, July 13th at 6:00 p.m.
Social Science is the themed “adult night” at the Science Museum of Minnesota, “welcoming those 21 and over to grab a drink, enjoy the museum, and experience innovative programming.” The theme this Thursday is “Fermentational Informational,” and focuses on the beautiful science of fermentation. This event is 21+ and costs $18.95 for nonmembers and $14.95 for MPR or Science Museum members. When: Thursday, July 13th at 6:30 p.m. When: Thursday, July 13th at 7:00 p.m. When: Thursday, July 13th at 7:30 p.m. and Friday, July 14th at 7:30 p.m.
See 2009’s blockbuster Star Trek reboot with the score played live by the Minnesota Orchestra, conducted by Sarah Hicks. There will be subtitles to improve the clarity of dialogue due to the performance. Tickets start at $30. When: Friday, July 14th at 5:00 p.m. Strange Boutique is hosting an opening reception for Heather Renne’s assemblage of art pieces. This is a chance to stop in, meet the artist, do some evening shopping, and see the pieces in the show, including a Travel Size Exorcism Kit and more. When: Friday, July 14th at 6:00 p.m. When: Friday, July 14th at 7:00 p.m.
Al-Stravaganza: A Burlesque Tribute to Weird Al! When: Friday, July 14th at 8:00 p.m. and Saturday, July 15th at 8:00 p.m. Bent Brewstillery and Fox Den present two nights that mash up two geeky favorites, Weird Al and burlesque. There will be unique performances, costume contests, and more. Take part in karaoke on Friday and a special screening on Saturday. Tickets start at $20. When: Friday, July 14th at 8:30 p.m. When: Saturday, July 15th at 8:30 a.m. When: Saturday, July 15th at 10:00 a.m.
Cosplay, photography, and BBQ will converge on Como Park West Picnic Grounds for Anime Twin Cities Cosplay Picnic. This event will go rain or shine, and Anime Twin Cities will be providing burgers, hot dogs, and bottled water. This is a potluck event, so bringing something to share is encouraged. Sandbox Theatre in Minneapolis will be selling a variety of costumes and accessories, from period to modern to beyond at bargain basement prices. Cash is preferred for this sale. See what you can find to up your cosplay to the next level. This one day comics convention will be held at the American Legion in Richfield, and feature comics, action figures, cards, and special guests Christopher Jones and Erik Burnham. Admission is free. Where: Northwest Corner of Wabasha St. and Kellog Blvd. Discover Saint Paul’s lesbian, gay, bisexual, transgender, and queer history on a walking tour led by Steward Van Cleve, the author of Land of 10,000 Loves: A History of Queer Minnesota. This tour includes walking on uneven terrain in the footsteps of greats like Gertrude Stein, Alice B. Toklas, and Oscar Wilde. Tickets are $14 or $11 for members. When: Saturday, July 15th at 1:00 p.m.
J.M. Lee’s Song of the Dark Crystal, the second companion novel to The Dark Crystal, is being released, and you can celebrate that with an event at Wild Rumpus books. This is a great chance to get to see the author who is also a consultant and writer for The Dark Crystal: Age of Resistance, a series coming to Netflix in 2017. See our profile of J. M. Lee from 2016 here. When: Saturday, July 15th at 6:00 p.m.
Dinosaurs! Beer! This event marks the opening to Byte’s dinosaur-themed art exhibition. The pieces revealed on the 15th will hang throughout August, and include the works of more than a dozen artists. When: Saturday, July 15th at 9:00 p.m.
Another free outdoor screening this week from the Minneapolis Park and Recreation Board is Rogue One: A Star Wars Story, a heist film about the Death Star, rag-tag pals, terrifying robots, and capes. This free showing begins 15 minutes after sundown. See our piece on Rogue One from December 2016. When: Sunday, July 16th at 12:00 p.m.